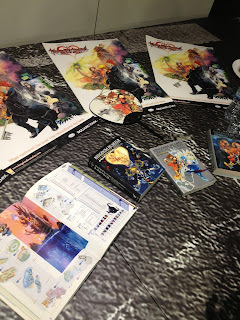 Just a Final Fantasy fan that loves to chat about Final Fantasy and Video Games in general! So I was was lucky enough to get an invite to the recent Kingdom Hearts 1.5 HD screening event that was held on the 26th April 2013, It was held at the Square-Enix offices in Wimbledon and was for a very small number of fans to be the first to get a glimpse at the up coming game in English! 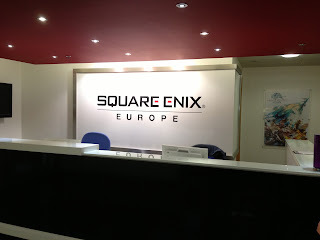 This is my first visit to the Square-Enix offices to say I was excited was an understatement seen as I am a huge Final Fantasy fan and Square-Enix follower. 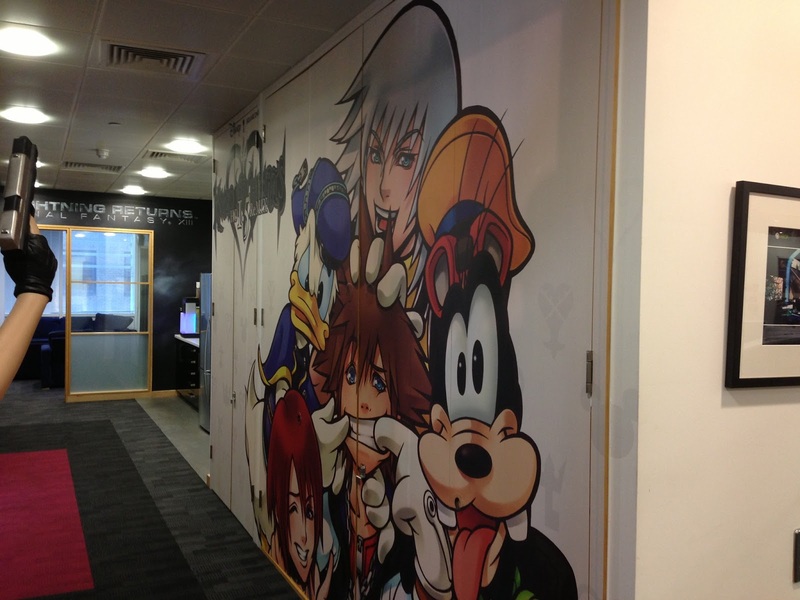 So you can imagine my face upon exiting the lift and seeing the Square-Enix Logo like a kid at Christmas! 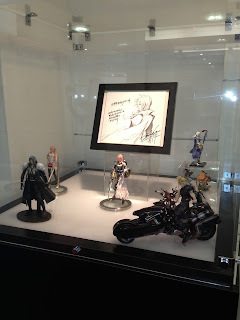 I immediately pan to my right and see a wonderful display of Final Fantasy figurines and more importantly the original sketch by Tetsuya Nomura (as shown Above) which he drew for the Final Fantasy 25th Anniversary Distant Worlds Event held last year (which I managed to attend) So my fan boy inside me is jumping round while outside I try to keep a cool face as ultimately we are here for one of Square-Enix other big franchises!! So after being nerded out by the Final Fantasy display I panned round to see a wall full of one of my favourite Final Fantasy's, Final Fantasy X. 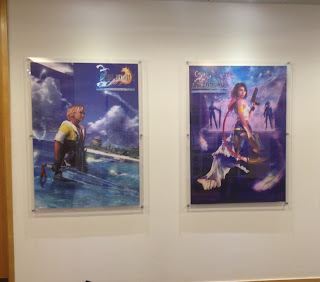 Alternating between two of the iconic characters in the game Tidus and Yuna, now most of you have seen these posters before back in 2002 when the game was released but the difference this time around was the small yet visible wording under the logo of HD Remastered. So you can imagine my excitement right now in the Square-Enix offices surround by amazing merchandise and images of one of my favourite Final Fantasy games!! Again I have to hold back the urge to burst out in giggle fits as we weren't here to see Final Fantasy! Then while myself and a few others were waiting there admiring whats on show the Rui Anderson the Square-Enix member of staff comes out to say hi and that they aren't quite ready yet to get going but if we could sign something while we are waiting, so immediately your thinking disclaimer but no it was permission to allow interview footage of ourselves to be distributed as they see fit. Ah Sh*t I thought do I really want people to see my ugly mug! While I'm thinking that I,m still signing the dam form! 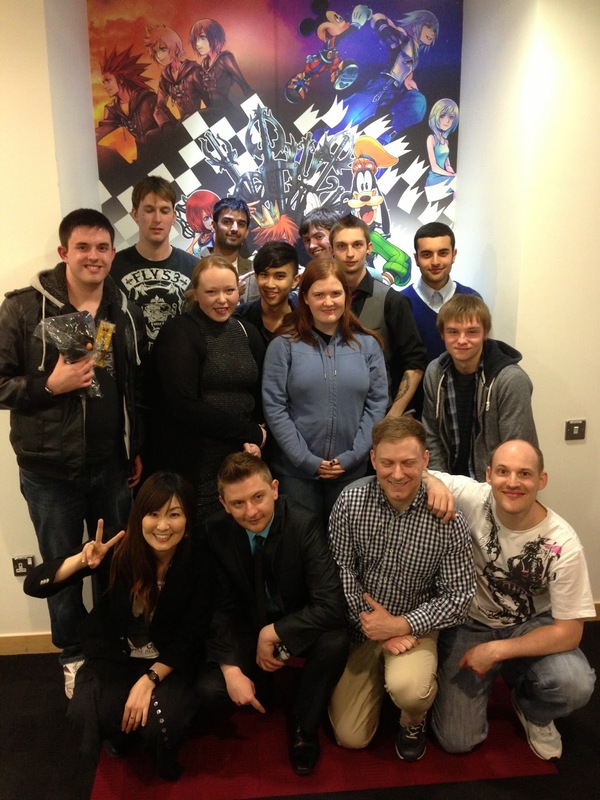 Then a few more people turn up big grins on each of there faces everyone just as I looked upon entering the offices. Once our forms were filled in we were lead to the right of the Square-Enix sign and what hits you through the set of glass doors is this amazing Kingdom Hearts Artwork, in prime location for everyone to see and enjoy. 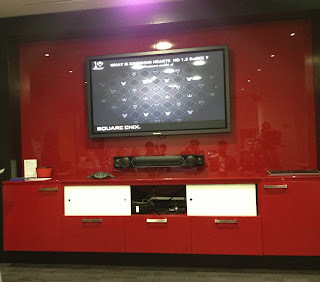 As we were still waiting for a few more to arrive we kindly got a tour of the lounge areas and conference rooms each with different themes from there upcoming games. 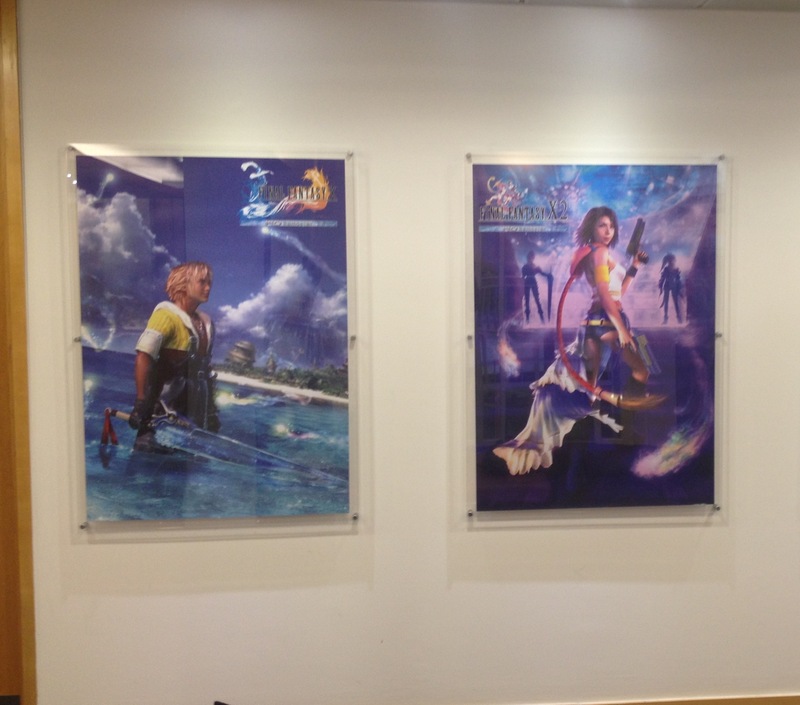 As you walk down the hall way the first thing that's apparent is the lengths Square-Enix try to push there branding for each of the upcoming games as shown above on the right of the hall way another wonderful Kingdom Hearts piece. (The gun you see in the picture is part of the life size Lara Croft statue they have) but at first glance you would think that Sora and co are about to get shot at !!!! So once we have had a quick tour and a few more arrived we are ushered into the room where the demo is to be shown, upon entering awaiting us on our seats were these totally un-expected gifts, a Heartless Plush and either a Donald Duck or Mickey Mouse mobile phone strap, behind where we was sitting a lovely laid out spread of Kingdom Hearts merchandise and nibbles. They even had a PS2 set up with the Original Kingdom Hearts for us to play on and a DS to enjoy after the showcase was finished. Just as I'm about to get my phone out to start to record some bits and take pictures we are told that unfortunately this time we aren't allowed to do so (Booooooo). 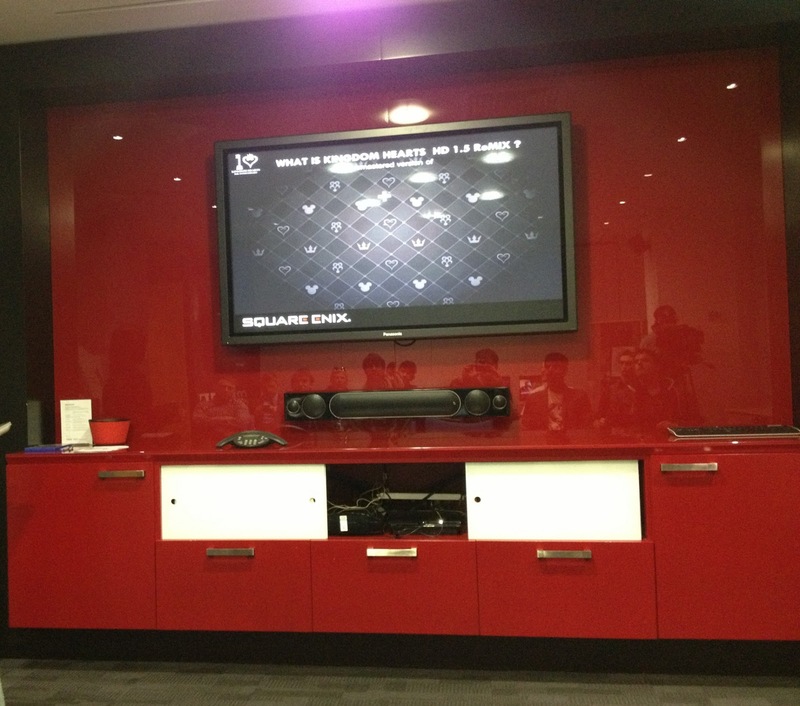 Once everyone is sat comfortably they load up the Kingdom Hearts game. The first thing that hit me was how sharp even the title screen looked and really set the tone for whats to come also something that I noticed straight away was the sound quality even from the title screen such a lovely ambient song and still remember it today 11 years on from the original release. As it was a private showing Rui Anderson the organizer of the event asked us what level we would like to see first after much silence she prompted by saying how about Halloween Town to which we all agreed to, so up popped the main hub music playing, there's me humming to it, then the gummy ship is selected again there's me humming the brief tune as the flight part was skipped and Halloween Town started. Immediately what hits you is the sharpness of the game even from memory the original looked good but when you compared the two as they had the original on show you really notice a difference just like the up coming FFX/X-2 HD remake. Also the clarity in audio, now whether this was due to the set up is something that I cant wait to test out as the soundtrack and voice overs are superb, again instant nostalgia of humming the tune and enjoying the game all over again. So once we saw a bit of Halloween town and a random invisible enemy (due to early code lol) we skipped to another couple of worlds Hallow Bastion and 100 Acre Wood which were equally as detailed. Once we had a good look at Kingdom Hearts we got to see RE: Chain of Memories, this was the part I was most intrigued about, as its an update of a remake in 3D from the GameBoy Colour game KH Chain of Memories that was released back in 2005. Now I never got the chance to play the original on GBA or the remake that came out in Japan in 2007 then USA in 2009. 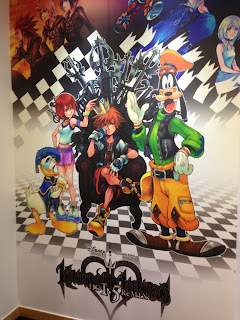 As I have never fully seen the remake on PS2 and vaguely remember the 2D sprites of the GBA version I was instantly gripped by what I saw, the level chosen was Atlantica, again the first thing thats apparentt from the get go was the detail just like the KH HD update this too looks sharp, what got my eye more was the tactical element compared to the first game as you fight with cards against your opponents either attack or use magic, there are even summon cards to aid you in battle. What was really great to see was the inclusion of voice acting and once again great sound. We then finally got to get a look a the last piece of content that is on the HD collection, this was to do with one of the more recent games in the series KH 358/2 Days on DS. Now this isnt a playable game as such, its a compilation of all the cut scenes within the original DS game, I personally didnt pay that much attention to this part as I will be playing the DS version at some point soon, but what I did notice once again is the detail and Sound quality. What is apparent throughout the entire collection is that the small team have put alot of effort into this little package from the amazing graphical updates to the wonderful sound quality! So the showing of the game was finished and it was then time for everyone to have a brief interview on what they thought about the game, while we were all waiting to be selected we all mingled and chatted while getting to check out the lovely spread that was laid out on the tables behind, showing off as previously mentioned the original on PS2 and a collection of amazing KH merchandise. 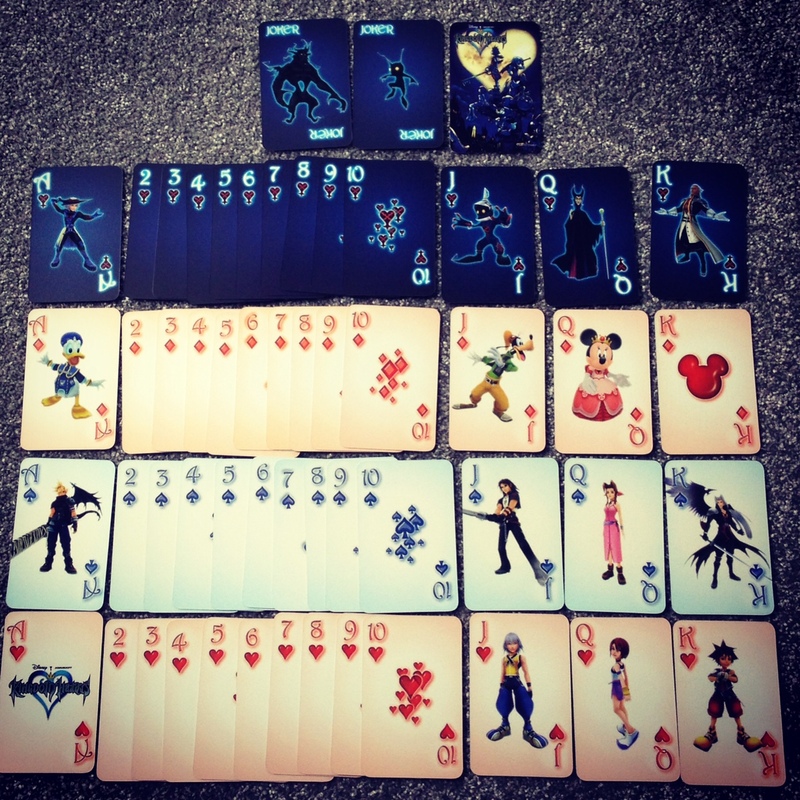 After I had my interview I came back into the room to be given this wonderful Limited Edition Kingdom Hearts playing cards which was another very nice surprise, we were told that originally as there was meant to be more people attending we wouldn't of had these so it was extra special!! Finally to top the night off we had a group photo of the selected winners of the Kingdom Hearts screening. 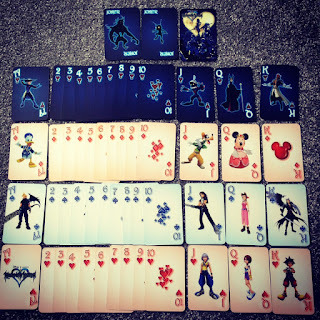 I will be honest im not the biggest Kingdom Hearts fan dont get me wrong I loved the first 2 games but kind of got lost with the numerous side games that came out but after seeing this little snippet of the HD remake it really got me excited for the release as it means I get to play one of the best PS2 RPG's again and also a sight into those that I missed out on. 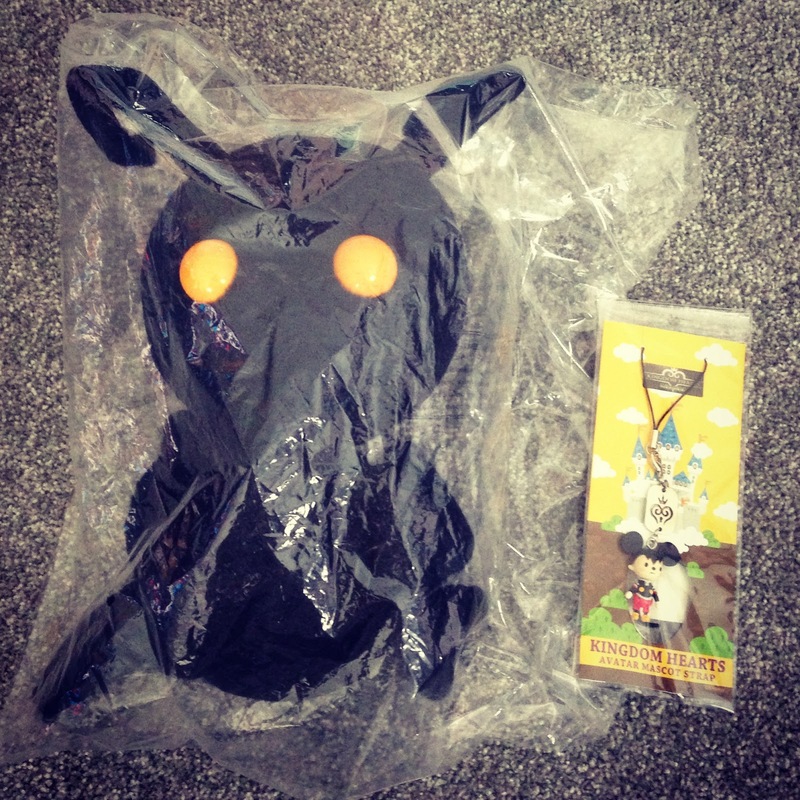 All in all it was a great evening as I got to visit the offices of my personal favourite video gaming company Square-Enix, I was one of the first to watch the English code of the upcoming KH 1.5 HD game and come home with some great un-expected gifts. 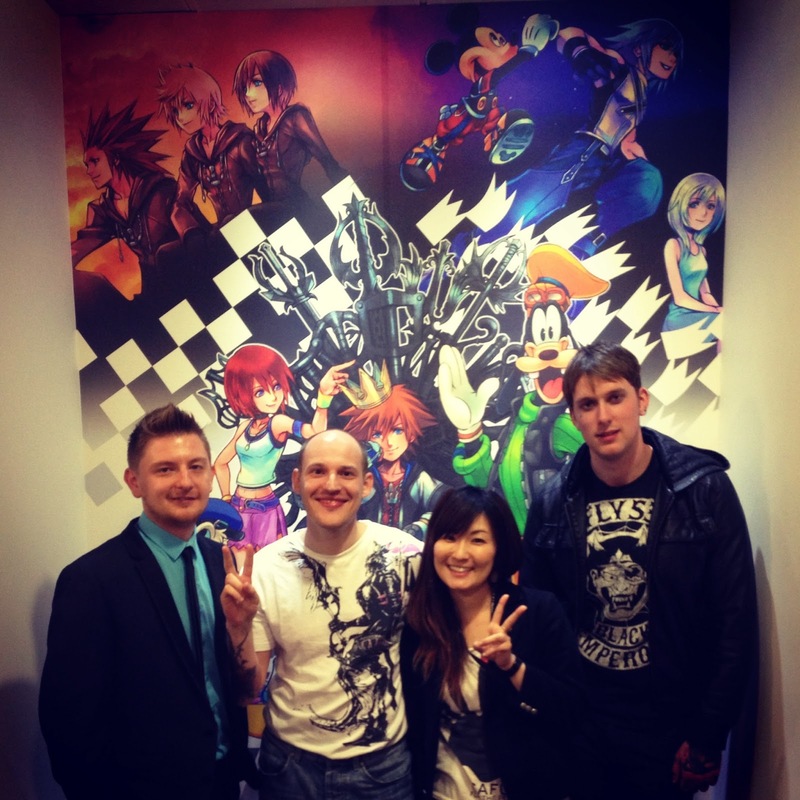 So for that I am grateful for being selected and would like to give a special thanks Rui Anderson & the Square-Enix team for having us at the event. You dont know the meaning of Tired !! My First Video Game Review! !